There are so many new products for us this Spring, I'm going to keep this limited to my top 4 favorites. If you follow my Instagram feed, you know I practically live in my Gear 2 Leather Pants almost year round. As long as it isn't below 60F, I'll pretty much live in them because they're so comfortable. This Spring, Rev'it is updating the Gear 2 with a new name but basically the same pant with a couple nice armor upgrades. The new Ignition 3 Pants (right) is pretty much the same pant as it's predecessor, the Gear 2's but with upgraded Level 2 Seeflex Knee Armor and Seesmart Level 1 Hips. Unfortunately this also means a price upgrade to $429 for the pants (previously $399). But worth $29 extra in my opinion for softer and more protective armor. Another new pant for us is the Varenne. The Varenne is a ladies version of the popular Axis Unisex Waterproof Overpants which are now discontinued. These feature full hip to knee full length, two way zippers on each leg for those of you looking for easy commute wear. Instead of riding in your skinny jeans, tights, shorts, chinos, and anything else that's not worthy of abrasion, check out these overpants. They're waterproof all the time and offer Seesoft Level 2 Knees and soft Seesmart Level 1 Hip protectors. They're simple, black and easy to wear and less than $200. And as always, available in (some) short and tall sizes for women (and the mens versions too). 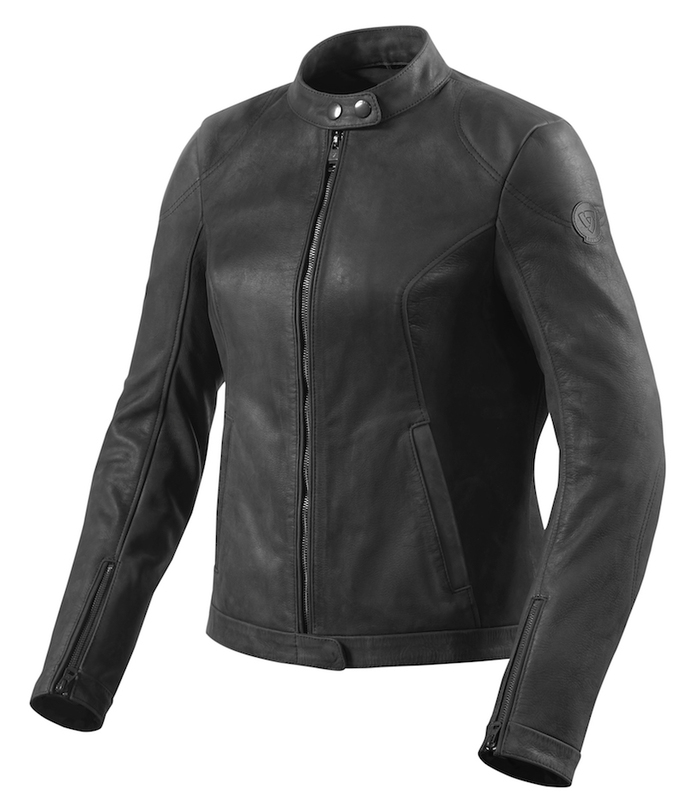 There are quite a few new additions to the rider looking for modern classic leather jackets. 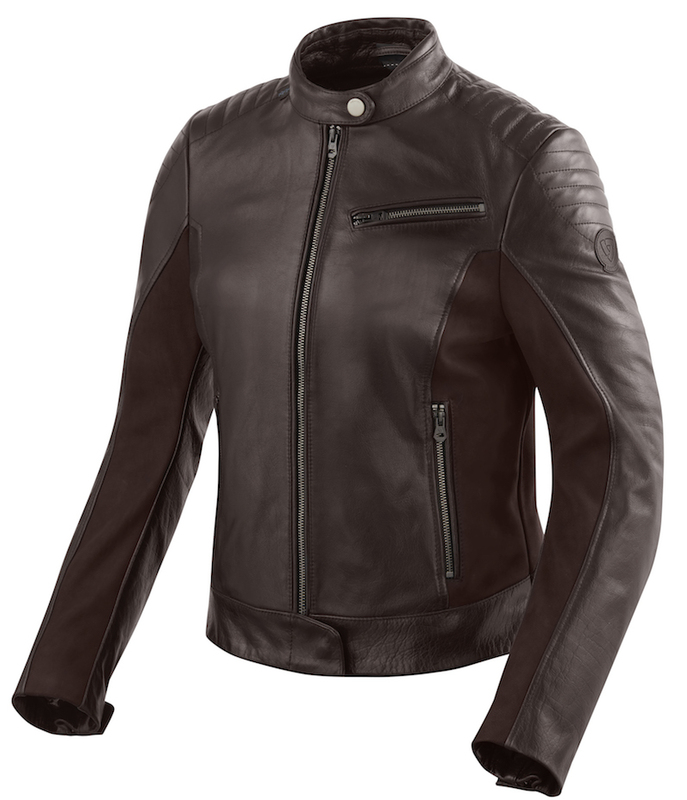 Three new jackets; the Clare, Rosa and Erin offer slightly different leathers, styles and colors. I want to see someone in that gorgeous red Clare. 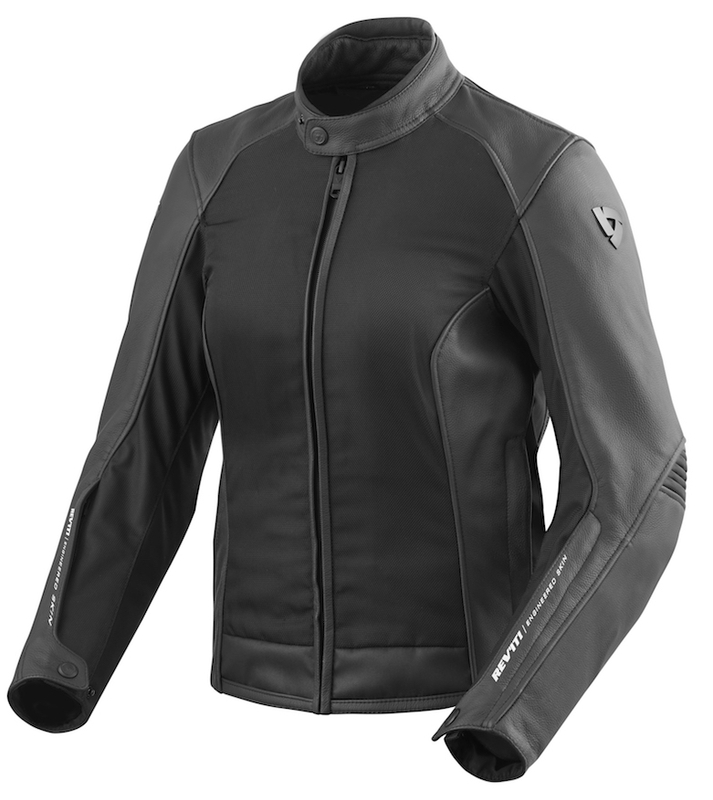 Softer Seesoft Level 1 armor is included (except the back) to make them even more comfortable while riding. Stay tuned for a review of my Rev'it Neptune GoreTex Suit ! My friend Chris needed some help finding gear. She met me at Scuderia the other day and we got her dressed! She's a ~US 10 on top and ~US 14 on bottom and has a 31" inseam. Her immediate needs were a pair of boots and riding pants. She's making the transition from a cruiser to a dual sport bike (woo hoo! ), with an upright riding position. 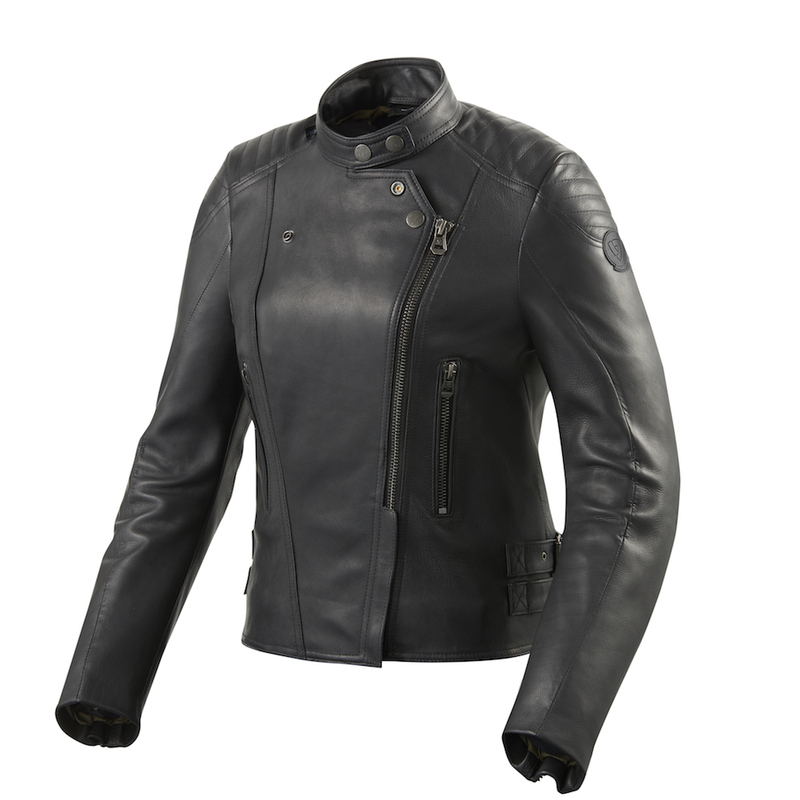 But she also likes to borrow her man's sportbike and wanted something that would be comfortable on that bike too. Chris is a real woman with real curves and she needed real gear. She wanted protection in the knees and hips, no mesh/ventilation (since she's commuting on the freeway) and enough room in the hips and her inseam. Although we couldn't get her into the Ventura pants like I wanted, we did get the unisex Horizon Pants, XXL Standard (see photo gallery) on her and they fit perfectly. The Horizon in XXL (standard length) were perfect (see photo gallery). As you can see, they fit her real curves nicely. The inseam is just right, the armor fell at the knees in the right place (although they are adjustable). They also come in standard, short and long. They don't have full length zippers, so they're supposed to be worn as pants. You could wear them as overpants without the thermal liner. You'd just have to take off your boots every time you needed to change in and out of them. Chris is wearing them over jeans in these photos. Unfortunately the Ladies Tornado 46 was a little too tight (without the thermal liner, over jeans), so we tried the men's 48 (over jeans, without the thermal liner). The rise (bottom of the crotch to top of the waistband) was way too short so she couldn't even get them on comfortably. We also figured out that the Horizon and Axis had the best female fit, meaning a slightly higher rise in the waist, room in the hips and thighs but a nice tapered fit at the knee. The problem with the Axis was that the legs didn't taper enough at the knees and just weren't as protective and fully featured as the Horizons. Although she didn't leave with one of them, here are two jackets that she tried on. Unfortunately I didn't have other colors in her size so you can see the difference between the two. She's wearing size 42 in both which translate to a 14-16 or L/XL. They're very similar, but slightly different in terms of price point and features. The one one the left is the Ventura. Read my review here. The one on the right is the Indigo (also available in hi viz). The Indigo doesn't have some of the features of the Ventura, and it's also a little bit longer in the torso and falls below the hips. Both of these would be great options for commuting, touring or everyday riding. I received an email the other day from a woman who is searching for Size 16 overpants. Anything over a size 12-14 is pretty difficult to find, but luckily I was able to give her a few suggestions. These all come in a true size 16 or equivalent.